HARTFORD,CT (May 9, 2013) – The National Association of Consumer Shows (NACS) 2013 Annual Convention is underway at the Hilton Chicago Hotel. This year’s three-day show celebrates 25 years of the convention and includes educational sessions focusing on the newest and best practices for consumer shows, which are attended by public show producers along with a vendor fair made up of general service contractors, industry service providers, and over 30 other destinations. Among the destination representatives is Heather Vieira, National Sales Manager for the Connecticut Convention Center. Vieira met with 51 public show producers interested in bringing their upcoming shows to Hartford and the state-owned facility. 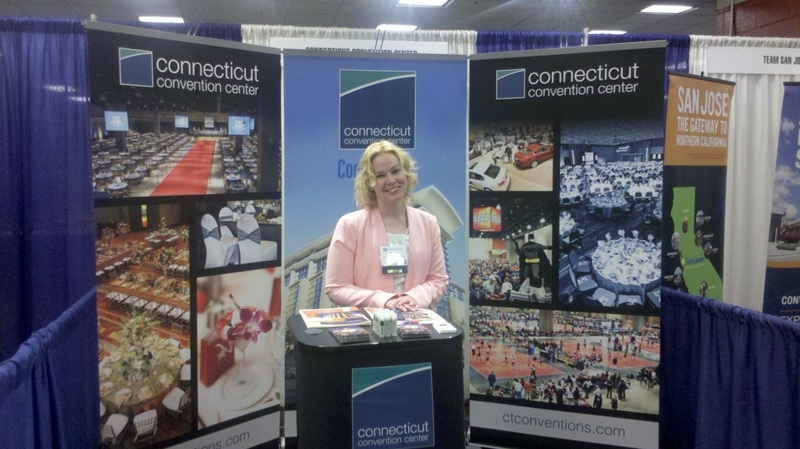 Heather Vieira, National Sales Manager for the Connecticut Convention Center, pictured at the NACS 2013 Annual Convention.